Review on the recent Cars on the Indian Road. Take a preview of some of the technologies and features these cars offer. Recently, many cars have appeared on the Indian road - some with exciting technologies and radical design features unheard of in the subcontinent till now. Land Rover, the British marque now owned by Tata Motors has come to India - along with another venerable marque - Jaguar. Toyota has brought in Land Cruiser with a V8 5.6 Liter diesel engine which produces some 381 Horse Powers. Toyota offers many SUVs - Prado, Land Cruiser and Fortuner. Although automobile market the world over is facing acute downward spiral with the top auto manufacturers going bust or declaring crippling losses, Indian scenario is strikingly buoyant. Compact cars are always in demand from the time of Maruti 800 in India. Tata Nano signalled the arrival of mature Compact cars. Maruti Ciaz, Datsun Go+ and Tata Bolt have arrived to hot up the scene. Tata Bolt follows its earlier sibling Tata Zest with similar power mill. Petrol Version of Bolt has 1193 cc 4 cylinder Revotron engine which belts 90 Bhp and 140 Nm torque figure. The diesel version uses the reliable Quadrajet engine that belts 75 Bhp but more torque - 190 Nm. Tata Bolt comes in many variants - XE at the lower end costing Rs.443617/- in Chennai for the Petrol version while the higher end version goes up to Rs.7 Lakh. Mahindra - seems to touch the pulse of the average Indian car buyer with its Cross Over XUV500 and now with its pared down version of Xylo - Quanto. This small sized SUV uses a cut down version of mHawk direct injection diesel engine - this time with 3 cylinders. It also has its spare wheel mounted on the tail gate. Mahindra claims that the base end version will be offered at a shade less than 6 lakh Rupees. When the dust settles, it remains to be seen how far they can keep this claim. French Car manufacturer Renault has set up a major car plant with Nissan in Oragadam, near Chennai in 2010. They have pumped in nearly 800 million dollars as investment and plan to produce cars and automobile components for their combined operations. Renault has brought out the Sedan - Fluence and SUV Duster. Their earlier partnership enterprise with M&M in the year 2005 resulted in Logan - car favored at one time by the travel cab operators. Renault Duster - offered at less than 10 Lakh - competes with the likes of Tata Safari, M&M's Scorpio and the forthcoming Ford Ecosport. The brilliant Fiat 1.3 L with Multijet technology in the diesel version and the frugal 1.4 L Fire Petrol engine version is noteworthy for other innovation as well - Blue & Me System which integrates Microsoft's Windows Mobile technology with automotive applications developed by Fiat. This system uses Bluetooth to enable your Mobile phone or PDA to communicate with the Car's Onboard system which can read aloud your SMS messages, lets you speak the name of the caller to call him and hear turn-by-turn directions through a GPS add-on. The sleek lines from the legendary Italian designers make this car - visually appealing as well. 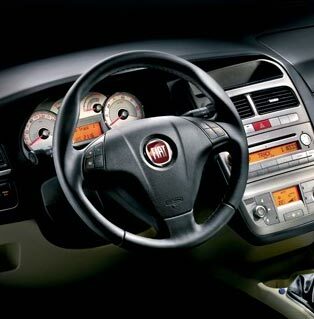 The extra active safety features like Anti-lock braking (ABS) with Electronic Brake force distribution (EBD) along with passive Safety features - Airbags for driver and co-driver complement the ruggedness of this car. The common rail Direct Injection diesel mill uses the Fiat/Bosch Multijet which offers extra ordinary economy and lower emissions/NVH levels. 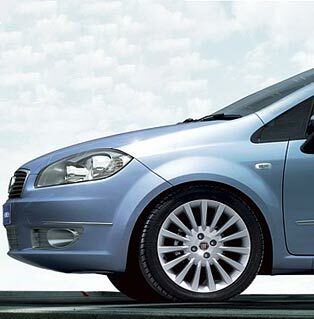 Originally developed by Fiat group which was later handed to Bosch - Multijet technology features a number of smaller injection of fuel into the combustion chamber which translates to smoother and quieter combustion of fuel and increased performance. The same Multijet powers other cars on the Indian Roads - Tata's Indica Vista and Maruti Suzuki's Swift Diesel. Linea's 1248 CC 16 Valves Multijet belts out 90 BHP @ 4000 RPM. It returns a remarkable fuel economy of almost 20 Km per liter of fuel on the highways. The top speed is about 165 km per hour. The Petrol Linea uses a 1368 CC engine with an output of 76 BHP @ 6000 RPM.